Today is the girls birthday party. I was up way too late and now way too early preparing. I made a cupcake recipe from scratch that might be the best I've ever tasted. Seriously.. you should try it sometime. 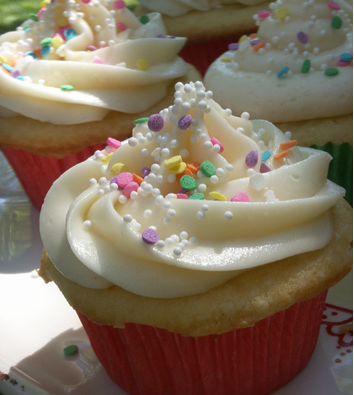 With this buttercream frosting recipe. It won't disappoint. Preheat oven to 350. Whisk dry ingredients in a bowl. Cream butter and sugar with a mixer until light and fluffy. Add eggs, 1 at a time, beating after each addition. Reduce speed to low. Mix any remaining wet ingredients in a bowl if needed. Add dry ingredients to butter mixture in 3 additions, alternating with remaining wet ingredients and always ending with dry. Scrape sides of bowl. Fill 2/3 full. Bake about 20 minutes. Let cool on wire racks. Umm YUM!!! I can't wait to try it out! Hope the party goes well. Can't wait to see pics! you're a super rad mom. The hubbs loves yellow cake recipes! Will have to try. Hope you were able to hit the hay early tonight. Those cupcakes look delicious! I hope the birthday party is lots of fun. Maybe you'll share photos? I have birthday parties on my mind as I'm planning one for my son whose birthday about a month away.